Welcome to the Saturday Football Academy! For Ages 5 to 14 years old! IT'S WHAT SATURDAY MORNINGS WERE MADE FOR! Why not come down and get involved in our Saturday Club in Ferndown. Our sessions start at 10am and run until 11.30am for 5 to 14 year old's. Including small sided tournaments, coaching drills covering all sorts of topics, great ways to meet new friends and a fun and positive way to build self esteem. Sessions cost £5 and the first taster session is free! King George V Playing Fields, Ferndown. With our fully organised sessions your child will interact with other children and learn social and footballing skills! We'll teach all the basics for your child to perhaps get to the Premier League! Well you never know! Saturday's include Penalty Shoot Outs, Passing, Tackling and the rules of the game. Please make sure your child has suitable clothing and footwear for the sports sessions. Please make sure that they bring a drink. Please make sure that your child does not bring anything containing nuts, including any type of sandwich spread that may contain nuts. Inform us if there are any medical conditions we need to know about. Also inform us who will be collecting them at the end of the session. 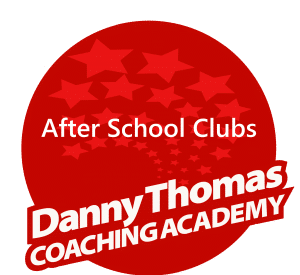 Danny Thomas Coaching Academy aims to ensure the safe and secure provision for children and young people at all our sport sessions. Therefore, safeguarding the welfare of children and young people is part of our core business. To view the policy click here.